Nov 10, 2018: The Ashok Leyland Dost is the company’s answer to the growing popularity and demand of the mini pickup segment. However, what is special about this particular model is that it has a very environment-efficient engine in the form of a CNG motor that is built with three cylinders. The motor can churn out a maximum power of 42 bhp and a peak torque of 105 Nm, which seems to be enough to fulfil the duties of an LCV. The braking is done by a hydraulic setup along with the addition of parking brakes. The front wheels are suspended over transverse leaf spring suspension while the rear has the two-stage overslung unit. 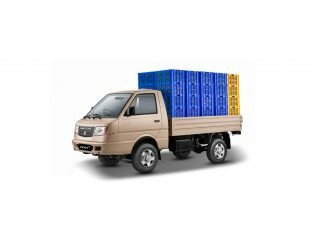 The Ashok Leyland Dost is one of the many amazing LCV mini pickup trucks to be available in the market presently. It is a direct rival to the legendary Tata Ace and its many variants. It was launched way back in 2011 and was the first product from the JV (joint venture) with Nissan. However, after it got the full control of the collaboration, the expansion of the Dost lineup started and we now have a plethora of variants. The Ashok Leyland Dost has just achieved a great number of late. Back in October 2018, the mini LCV sold 5,022 units, which is the best-ever sales number it has had in its tenure. Moreover, in FY2018, the company sold a total of 39,865 units. It presently holds 17% market share in the country, which is led by Mahindra with 64%. The Ashok Leyland Dost is one of the best small capacity LCV pickups in the segment and is decently powerful as well. It is powered by a 1.5-litre, three-cylinder engine that can churn out a maximum power of 58 bhp at 3,300 rpm, along with a peak torque of 157.7 Nm, which comes between 1,600 and 2,400 rpm. The produced power is channelled to the wheels via a 5-speed manual gearbox with the help of a 215 mm single-plate clutch. The performance is above par and the 4x4 axle configuration works wonders too. The minivan can go at a top speed of 80 kmph and provides a mileage of around 17 kmpl. The Ashok Leyland Dost looks a little similar to the Tata Ace, its close competitor, albeit with a protruding nose. However, it looks and feels more plush and urban. It has a day cabin and a cargo carriage deck built on the chassis as standard. However, the cabin is not tiltable. The carriage deck looks longer than its closest rival too. The mini truck measures 4.48 metres in length and 1.83 metres in length. The gross vehicle weight is 2,545 kilograms, which makes for a good enough kerb weight and payload capacity. The overall kerb weight is 1,295 kilograms while the payload capacity is 1,250 kilograms. The Ashok Leyland Dost is a great handler, thanks to the power steering and amazing throttle response. The turning radius is small too (just 5.8 metres), which indicates the ease of taking a U-turn in a cramped area. The pickup truck has an off-road gradeability of 29%, which is pretty much on the decent side. This, along with the 177 mm ground clearance and 4x4 axle configuration, makes for an effortless drive on bad roads. It is suspended over Transverse leaf spring suspension on the front axle while the rear has a 4-stage Overslung unit. The Ashok Leyland Dost gets Hydraulic brakes instead of a combination of disc-drum that most other competitors have. This setup allows to have a very commercial fleet-focused braking with great feedback on the pedal. However, since it is mostly used for city goods and cargo movement, ABS is not offered even as an option. As for the safety system, the mini pickup has seatbelts for the D+1 occupant layout inside the cabin. Further, parking brakes are offered too, in case you need to park the vehicle on a hilly gradient or on the incline of a bridge. As described earlier too, the Ashok Leyland Dost has a very plush design with long wheel overhangs, especially in the front. It looks bigger than the Tata Ace, for sure. Plus, it offers great comfort for the occupants inside the cabin. The day cabin comes with the air-conditioning feature given as standard, something that most other trucks in the range lack in. The power steering wheel has a tiltable column, which makes driving more convenient for the driver. The seat can be adjusted according to the convenience of the driver too. The tubeless tyres make sure that there is less damage over time.